Photo by Jasin Boland ©2015 Warner Bros. All Rights Reserved. Miller and Hardy check a video playback of a scene. Most of the stunts were live in this literally action-packed film! 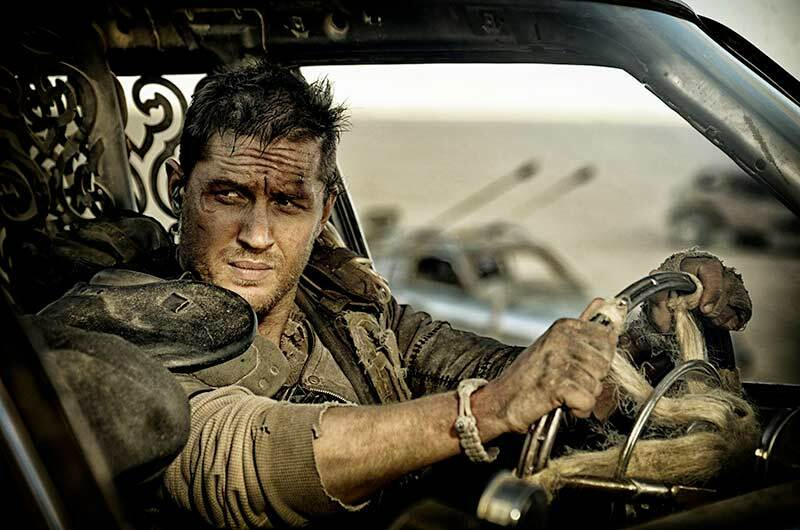 “Max and Furiosa are very similar characters and they develop an unspoken understanding of kindred spirits,” says Hardy. 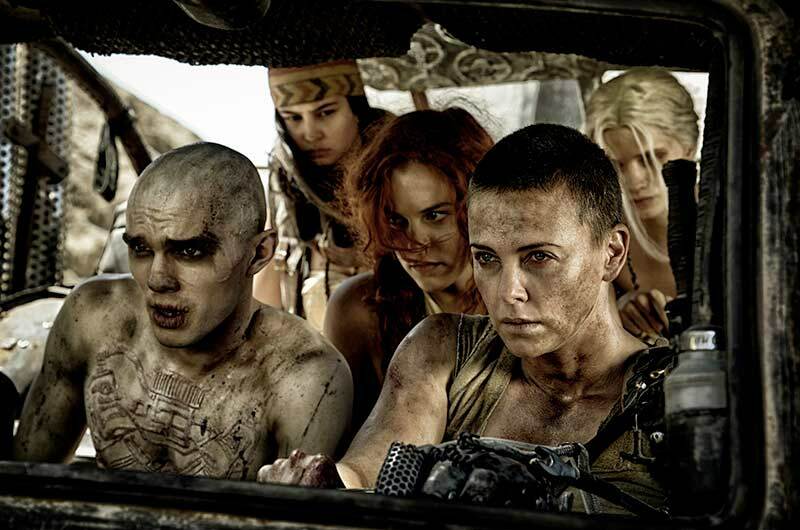 Charlize Theron, Zoe Kravitz, Courtney Eaton, Riley Keough, Tom Hardy, Nicholas Hoult. Photo by Jasin Boland ©2015 Warner Bros. All Rights Reserved. Photo©2015 Warner Bros. All Rights Reserved. ©2015 Warner Bros. All Rights Reserved. 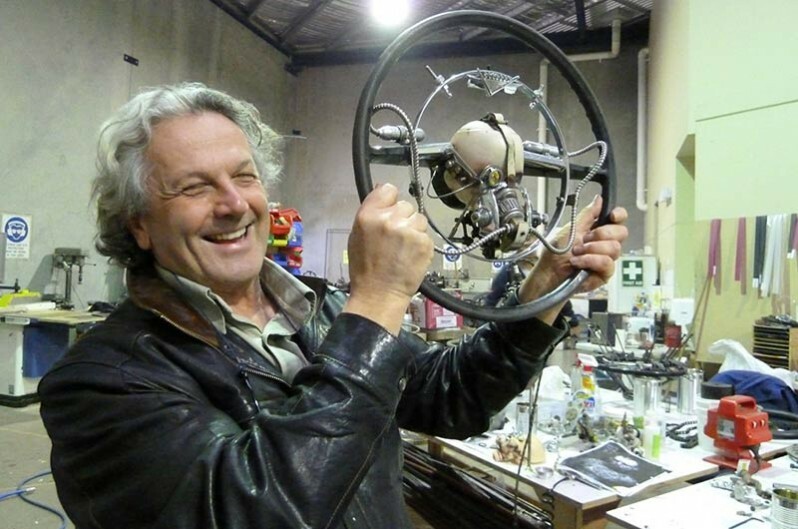 Director George Miller approves the signature steering wheel design! 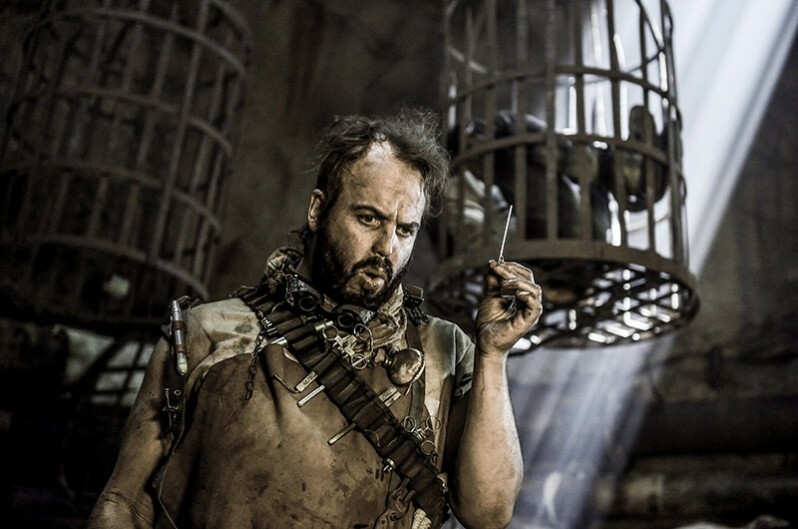 The Organic Mechanic [Angus Sampson] is in charge of the involuntary blood donors…and other macabre aspects! 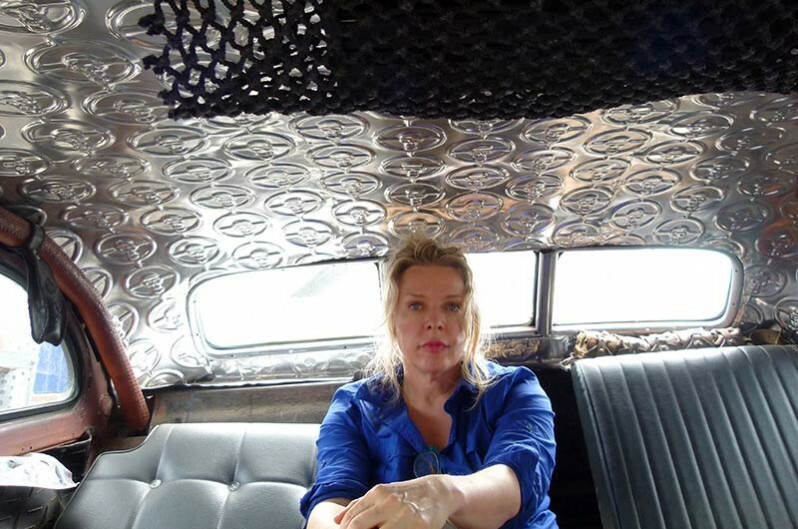 Set Decorator Lisa Thompson SDSA in the early stages of the War Rig interior, obviously before the aging has begun! 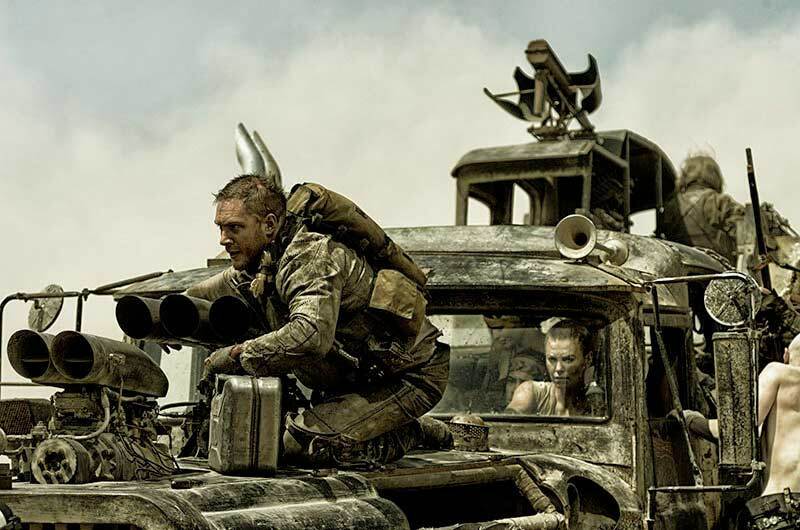 From director George Miller, originator of the post-apocalyptic genre and mastermind behind the legendary MAD MAX franchise, comes MAD MAX: FURY ROAD, a return to the world of the Road Warrior, Max Rockatansky. 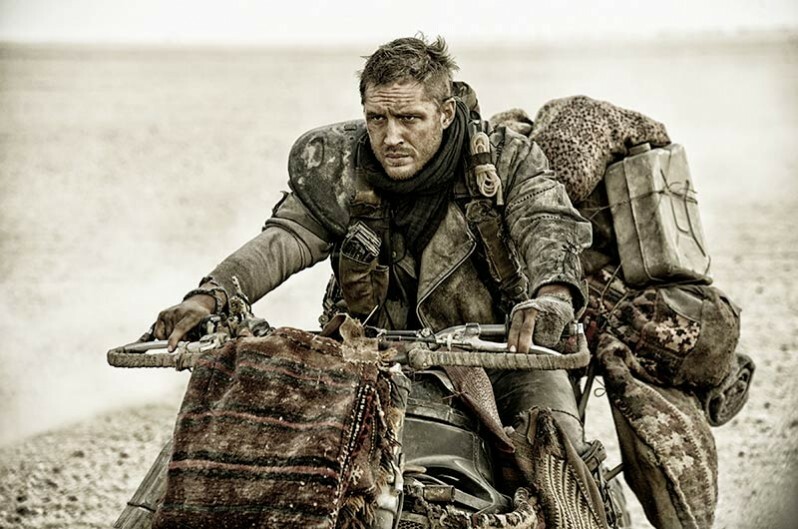 Haunted by his turbulent past, Mad Max [Tom Hardy] believes the best way to survive is to wander alone. 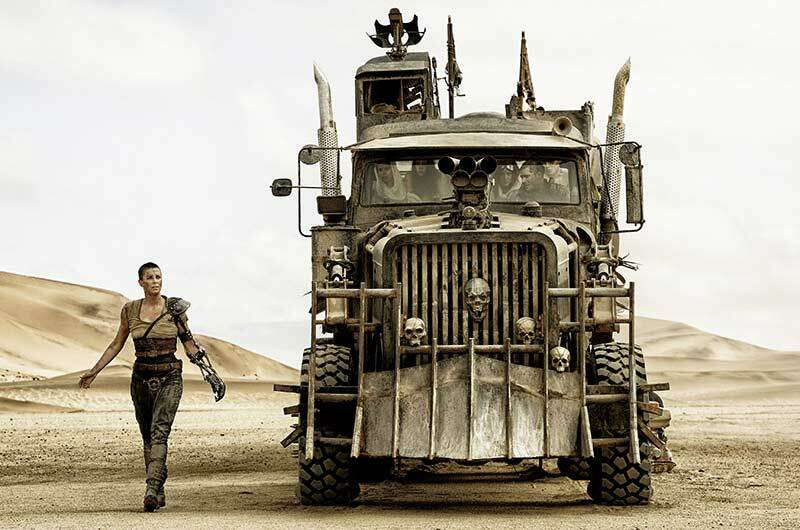 Nevertheless, he becomes swept up with a group fleeing across the Wasteland in a War Rig driven by Imperator Furiosa [Charlize Theron]. 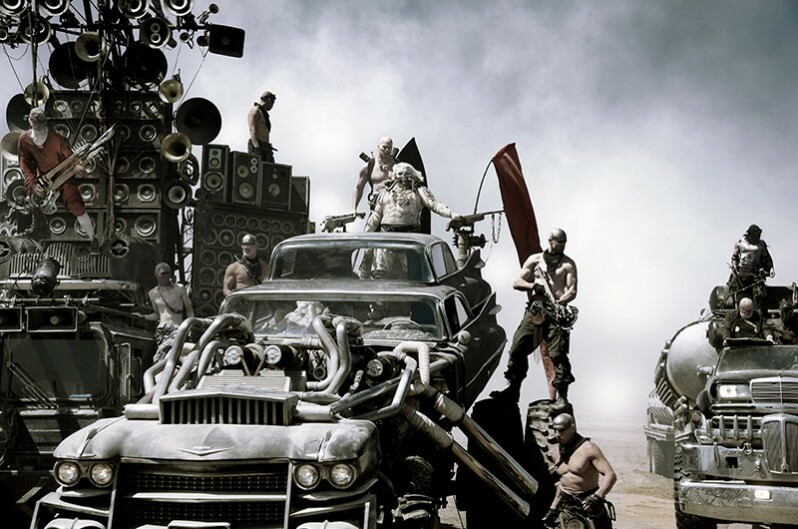 They are escaping a Citadel tyrannized by the Immortan Joe [Hugh Keays-Byrne], from whom something irreplaceable has been taken. Enraged, the warlord marshals all his gangs and pursues the rebels ruthlessly in the high-octane Road War that follows. 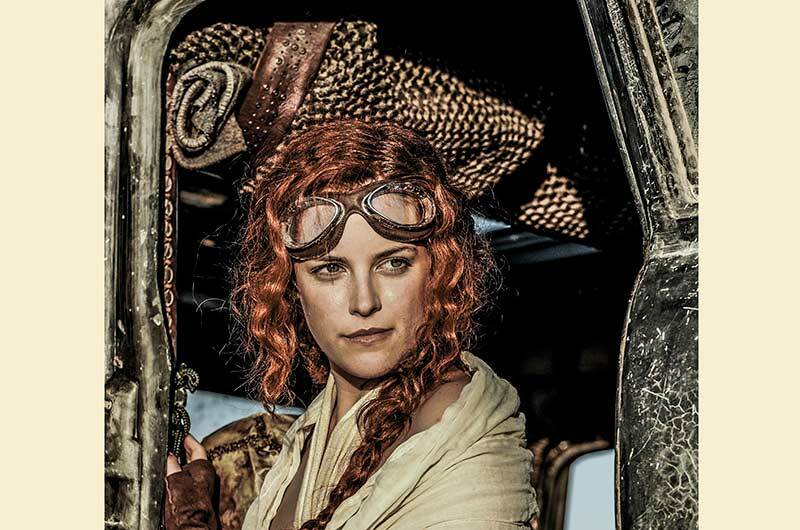 The quest to immerse today’s audiences in Miller’s mad future with “Mad Max: Fury Road” would cross continents and span more than a decade. It would leverage the talents of hundreds of artists to design and fabricate an authentic post-apocalyptic universe, from the creation of 3,500 storyboards to thousands of props and costumes. 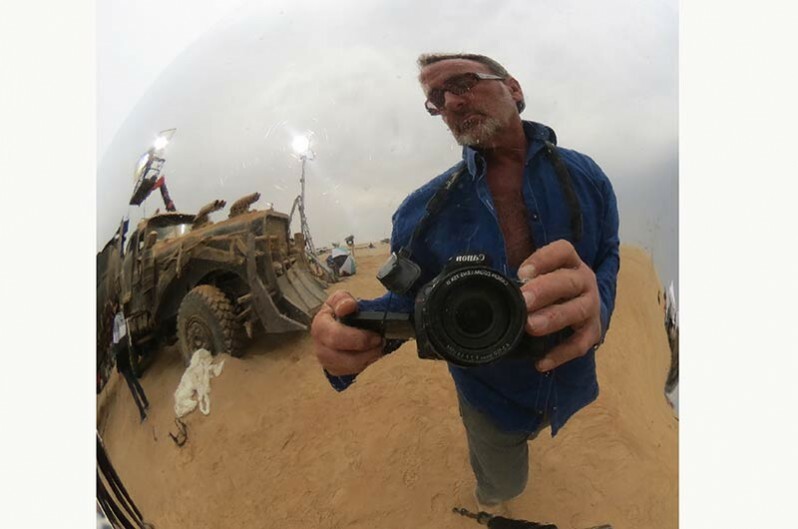 In a logistical operation of unprecedented scale, the monumental production would hurl cast, crew and 150 hand-built drivable vehicles through the deserts of Namibia to stage a real-life Road War across multiple units for 120 days. “George essentially invented the post- apocalyptic atmosphere we now see in so many videogames and movies,” says actor Tom Hardy. 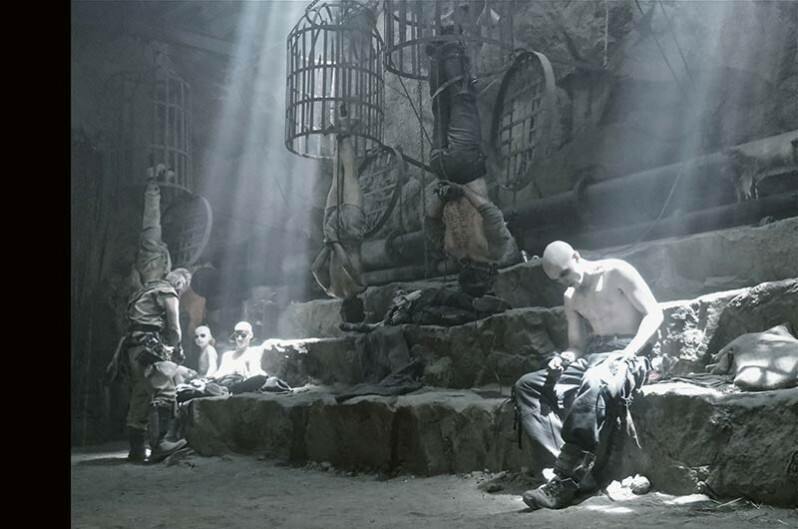 “That’s his canvas, and he’s continuing to paint on it with all of the assets he has at his fingertips.” The assets include Director of Photography John Seale and his crew, Editor Margaret Sixel, the integral work of Production Designer Colin Gibson and Set Decorator Lisa Thompson SDSA and their teams, and myriad other departments and collaborators. 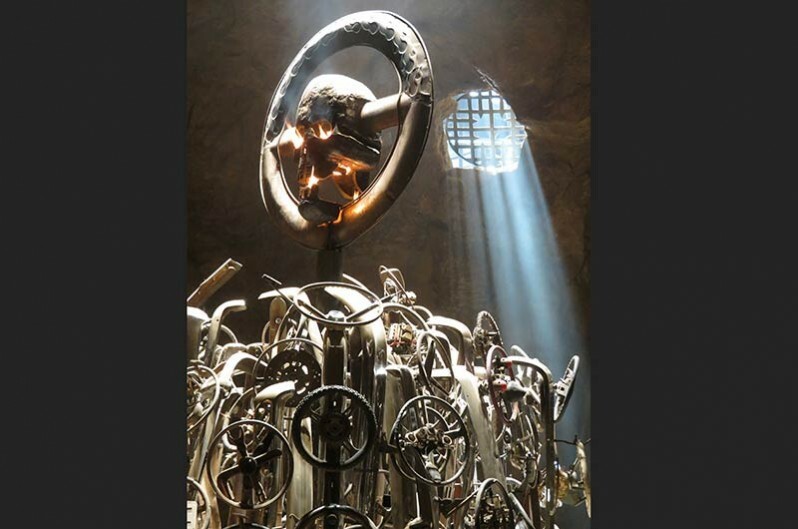 George Miller: Well, it’s interesting how a movie works, because Colin said, “I want to use pressed tin with the Immortan Joe logo on the ceiling.” And it looked really great. I remember one afternoon, I saw Abbey Lee who played The Dag doing exactly that, just tracing it with her finger, and the light was hitting it, and I thought, “Oh wow!” And we used that at the beginning of a particular scene. So there’s a really good example of how set decoration leads to an onscreen moment, a moment of reflection. It’s a pretty kinetic movie, but it was a quiet moment and it helps character, it helps story. And until this moment, it never occurred to me to talk about it. 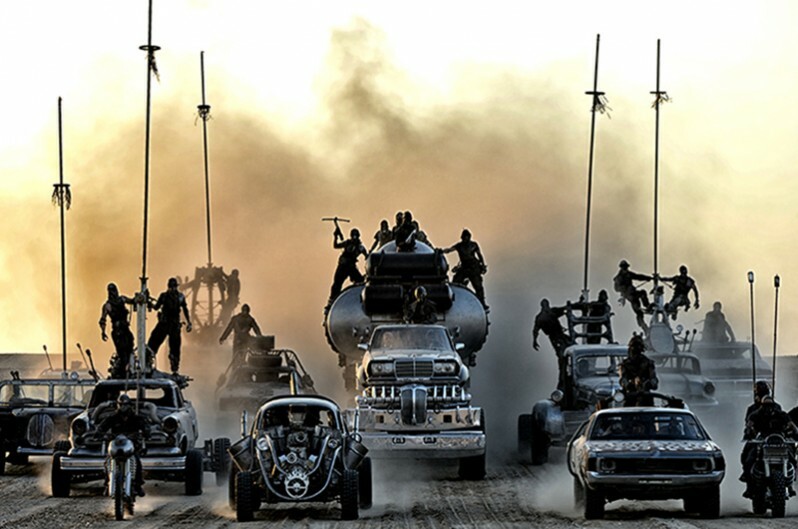 George Miller: Well, when we made the first MAD MAX movies—that was 30 years ago—in some way or another they helped kick-off a post apocalyptic aesthetic. But what tended to happen was that everyone made it look like a junkyard, all rust and disuse. And I realized two things. One, if we were going to be in this world for all this time, it could get very maddening. Too much visual noise can become annoying. The second thing, and the most important one, is when you look at us as humankind, no mater how impoverished we are, we still have a path of an aesthetic. I always loved Paleolithic man, with the rock drawings and carvings. In Australia, where I come from, we have with in our indigenous culture the oldest continuous culture, and some of their work is gorgeous and it’s at least 40,000 years old. So, that’s key. Anything that exists in the Wasteland is a found object that’s been repurposed. There’s no mass production. 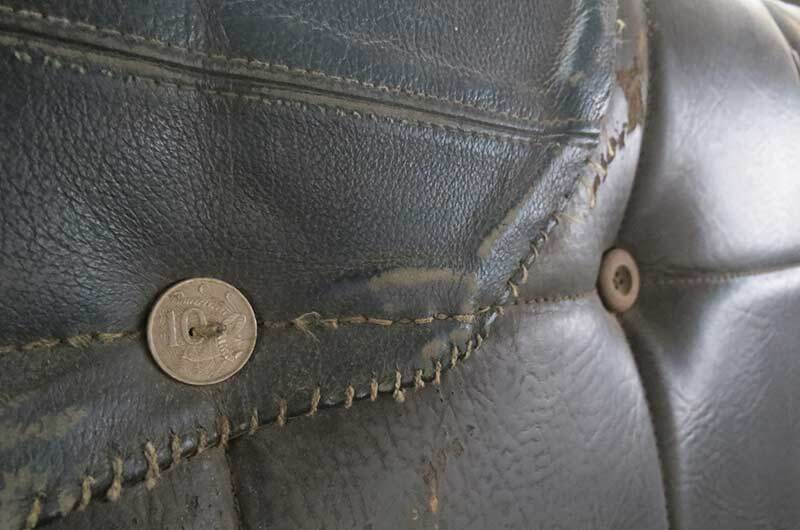 And once people grabbed onto that, it was always their personal interpretation of objects repurposed. 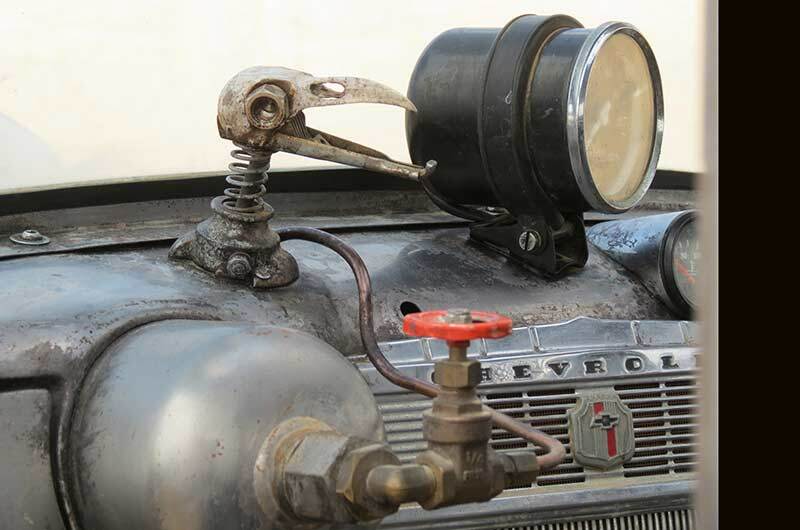 So, even if you didn’t have a lot of technology or a wide color palette, you could still take a steering wheel or a brake or an accelerator on a war rig and repurpose it. 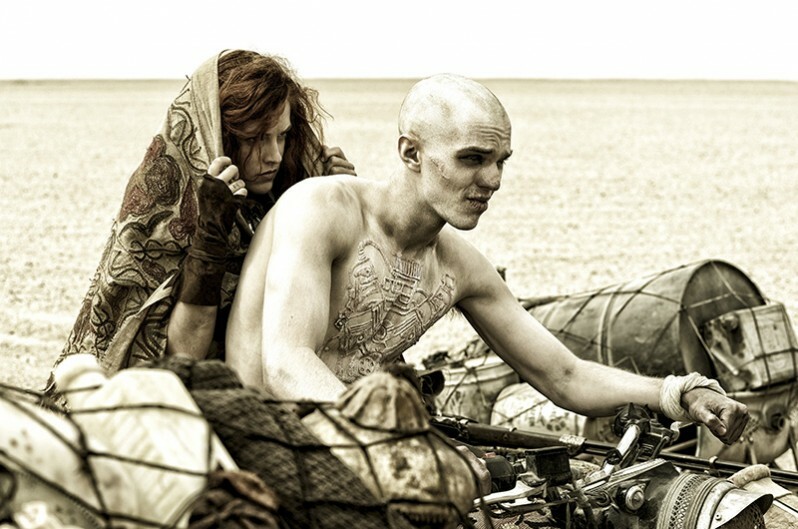 I mean, one of my favorite shots in the movie, is when Furiosa locks in the accelerator while driving in order to move over so Max can take over driving. 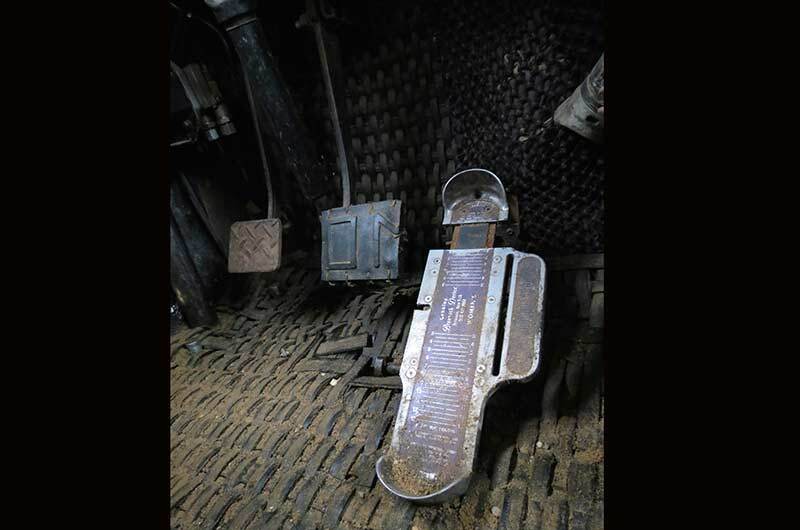 And the brace is one of those metal things used to measure feet for shoes! And that sort of thing happened over and over again, once everybody was working from the same sort of rules. As you said, once you can get into that groove, that way of thinking/seeing, you’re literally stepping into the world that you are creating. George Miller: Yes, definitely! Colin and Lisa and their people…and then Jenny Beaven and all her department who did costumes, and Lesley Vanderwalt who did all the makeup and hair – with the same rules always applying. And in many ways, it’s quite liberating because, providing everyone worked within those same boundary conditions, they could express themselves freely. SET DECOR: Did you have a lot of rejects? 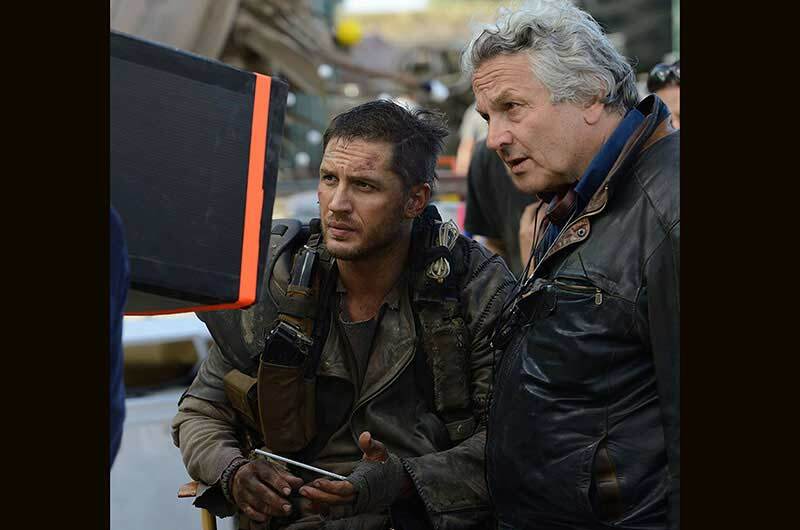 George Miller: Not so much rejects, but there were a lot of iterations. 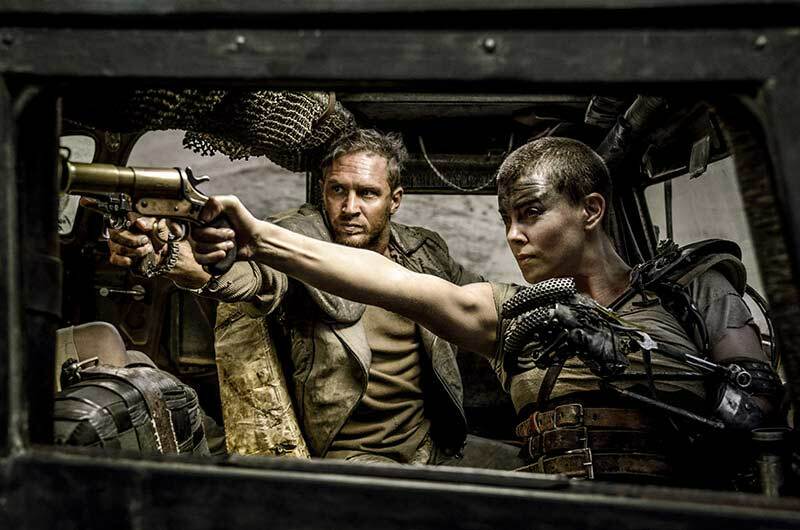 For instance, Furiosa’s arm was a tricky one, mainly in how it was going to work and remembering that Charlize had to carry that through 8 months of shooting. It needed to be light enough and it needed to work! But it also had to look, again, as if it were made from repurposed found objects. I must say, it was fun to work out. It was interesting and we’d have to go in and build and change. We couldn’t repeat an idea, everything had to be special. And everything had to have multiple purposes, like a Swiss army knife. The guitar started out as a hospital bedpan. It became a double neck guitar, but it was also a flamethrower, because he had to have a weapon as well. You know, before amplified sound, or modern communications, war always had its music, the drums and bugles and bagpipes, but now none of those would be heard [over the noise of the vehicles and firepower]. So he had to have ways to amplify. All of that had its own logic. Otherwise it’s a pretty wild, kinetic movie anyway, so without the underlying logic for each piece, it would be just visual noise. SET DECOR: Were there visual elements that you had specifically wanted? Specifics you asked for? 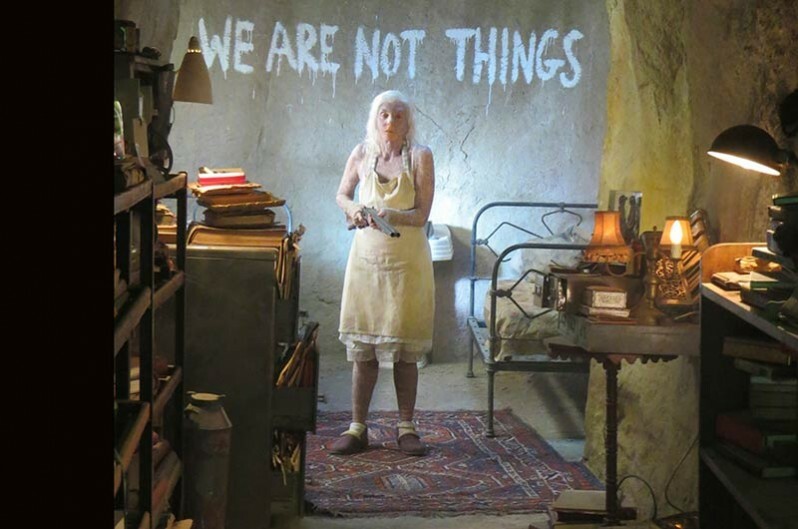 George Miller: Yes, always. I mean I’ve always been visual more than I’ve been aural. 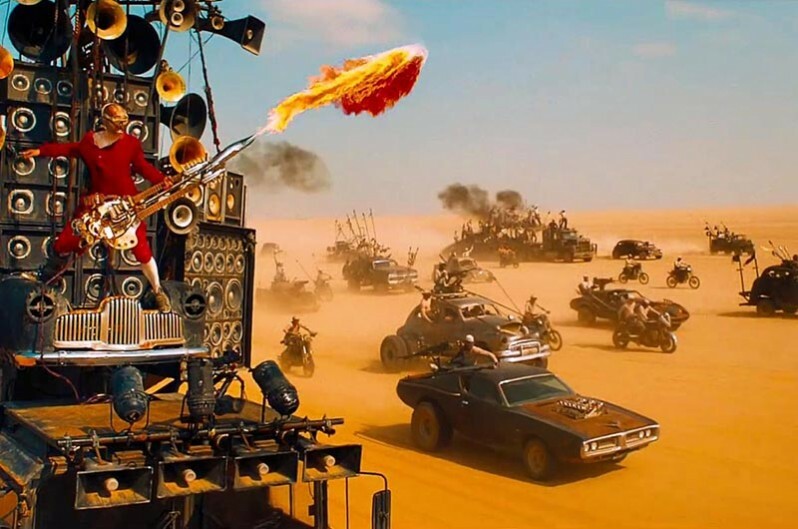 I think of action movies as a kind of visual music, and FURY ROAD is somewhere between a wild rock concert and an opera. The first iteration of the movie was in storyboards. I worked with 3 storyboard artists, but particularly with Brendan McCarthy, who is a wonderful graphic artist/graphic novelist, very influential in the ‘80s and ‘90s. When we started to work together, he was doing concept drawings, and then we developed it from there. So it’s for the eye first. I like to call this movie a silent movie with sound. Everything ultimately is about story—that is the experience that the audience takes from it. And it’s allegorical, so in many ways, it’s in the eyes of the beholder. 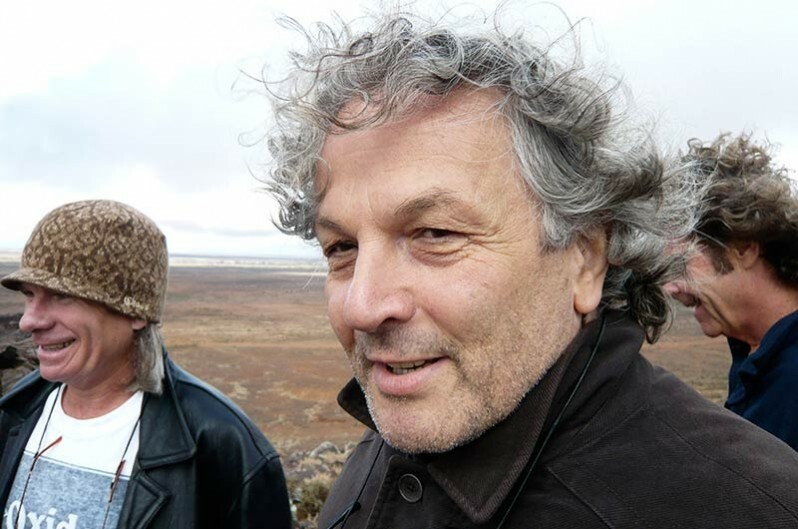 George Miller: Oh yeah! 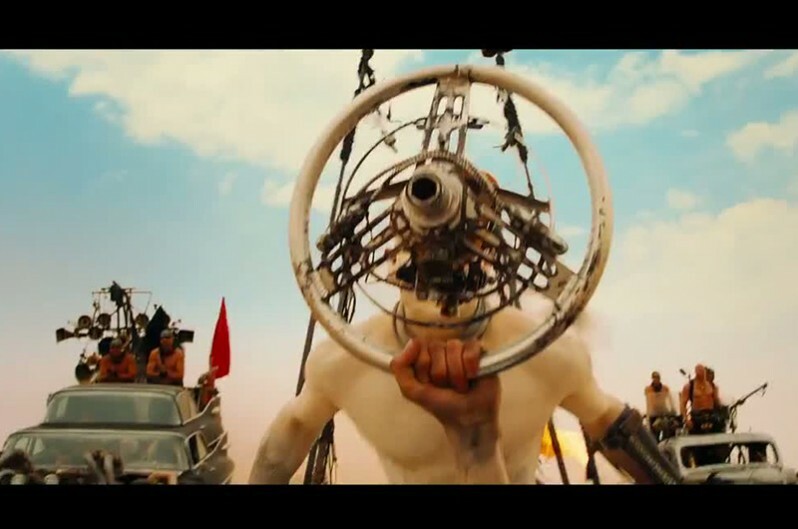 Even just little things like on Nux’s car, Nick Hoult’s, there’s a little bird made of car parts with eyes made of bolts…and it wobbles! So, as we’re talking, I’m just now remembering all this stuff. There were all these little delights and surprises. 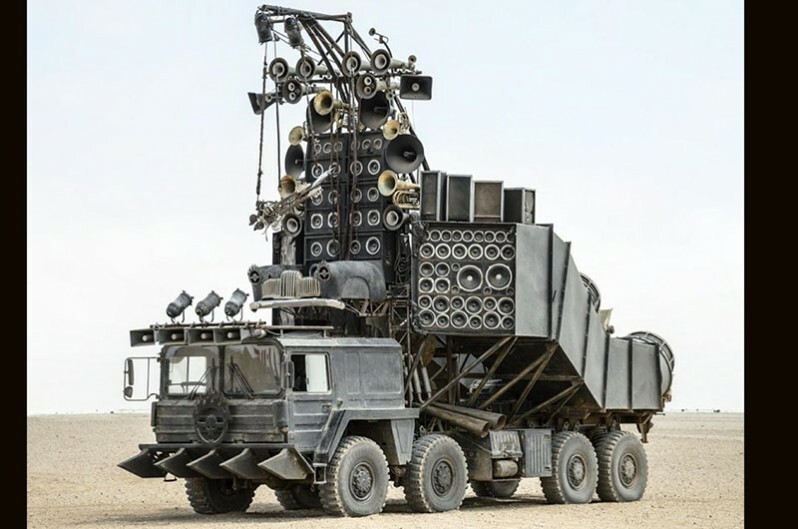 So the more detail, the better for this, especially the war rig… You see, I knew that when we’re on the road, when the story is moving, it’s often the same set, the same vehicle, the War Rig. It’s the same all the time through a 2-3 hour movie, so it had better be interesting! So every part of the War Rig had to be very, very detailed. When it got to the bigger sets, we had to be careful to get the balance of a world in the aftermath of an apocalypse that was all the worse-case scenarios you hear on the news but all at once…and now we’re 45 years into the future on a continent that is a little bit like Australia, a semi-arid continent. 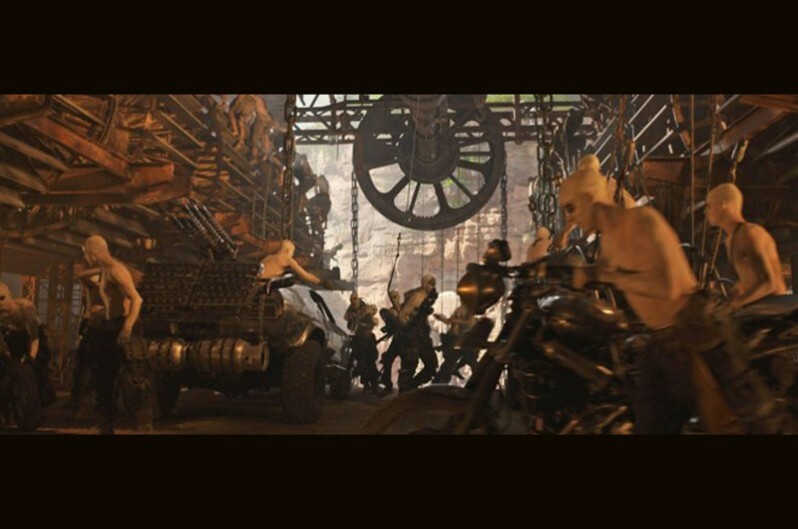 The Citadel had a backstory that before Immortan and his big marauding gang had taken over, it was probably built by mining engineers who used it to haul all of their equipment up into safety. And then he took it over and repurposed it for his more military pupose. So we built this layered world. And we created a place called Gastown, which you barely see briefly in the movie, and the Bulletfarm, which we only ever allude to. We’ve got maps of the world and legends of the world, so we all worked within that. One of the things about the Immortan’s Citadel was that they would have carved his symbol on the rocks, but they wouldn’t have spent too much time chipping away on it, so it’s rough-hewn. We had to get that balance right between spectacle for its own sake, and what this world could have achieved. George Miller: Yes. And the artistry was in the steering wheel. 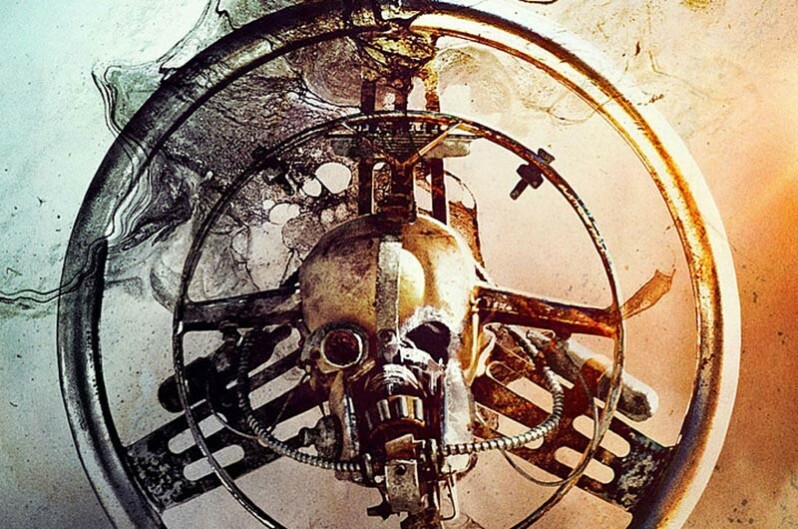 If a machine survived and it worked, they distorted into basically folklore and mythology, and the Immortan manipulated it into kind of a religious cult. So the steering wheel obviously has significance: it’s the way you steer your vehicle, it’s the symbol that gives you the authority to drive, it’s literally the key. And you do the sign of the V-8, the V-8 engine! 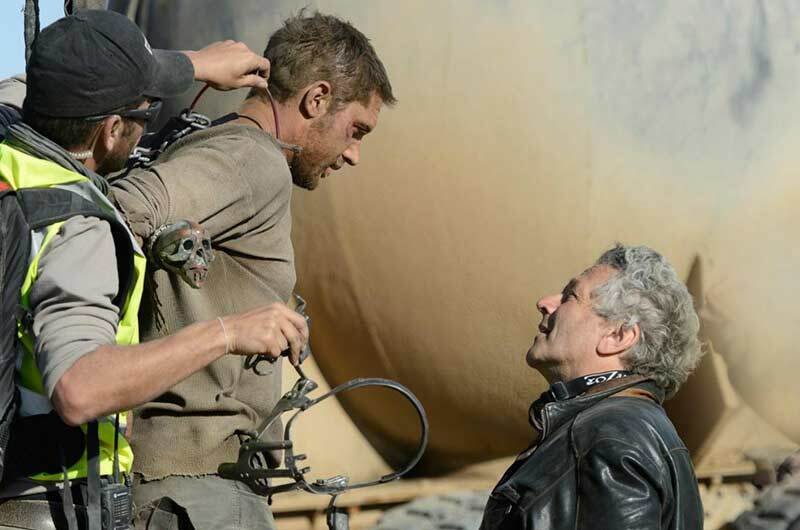 George Miller: Yes, it’s the hangout, the quarters of the War Boys, military quarters of a sort. 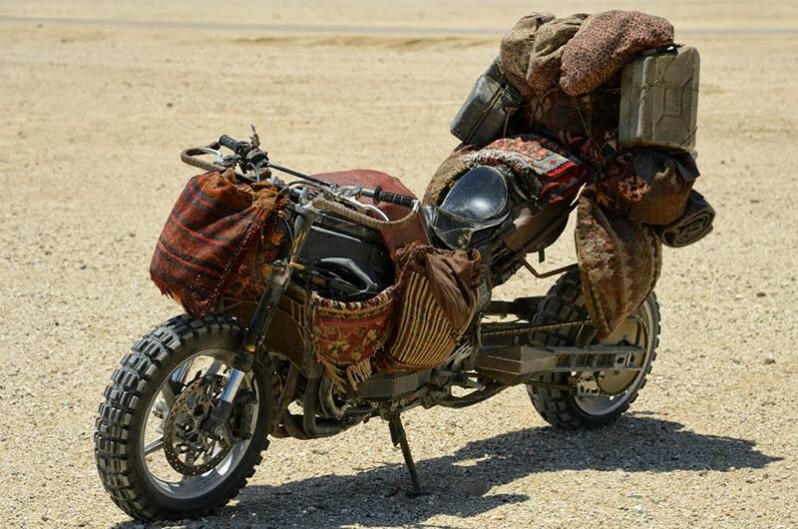 The War Boys cycle half-lives. They’re suffering from some disease…I didn’t specify what, I imagine some tumors and a leukemia-like blood disease…so they need what they call Full Lives, which Max is, and they hook up to them to get healthy blood. 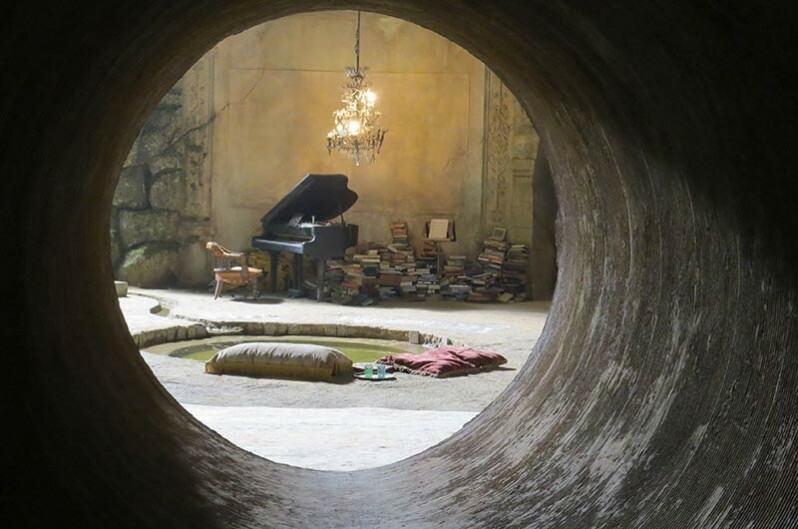 SET DECOR: The film includes such a range: from this extreme society, to the artistry, to addressing environmental concerns. We’re pleased that you are here to receive an award re: the environment, the Environmental Media Association’s Lifetime Achievement award. George Miller: That was really quite great. I never thought about it until that award, but I grew up in remote, rural Australia, spent so much time in the bush playing with indigenous kids, and we’re on horses and bikes and so aware of the landscapes. And then later on in life, I went to medical school. I had the benefit of a scientific education. And so I’m very aware of what science is, and its ability to predict…and of environmental issues. But when they gave me the award, that was a happy surprise. I’m a storyteller, not a scientist! I think they considered me because of both the HAPPY FEET movies and the MAD MAX movies. My wife Margaret cut the HAPPY FEET movies, and then this one, so she deserves a lot of credit. I wanted this to be different, to have its own look. She has a very clear problem-solving logic and a has very, very strong aesthetic, and won’t let a false note come through. SET DECOR: That comes across through both of you. 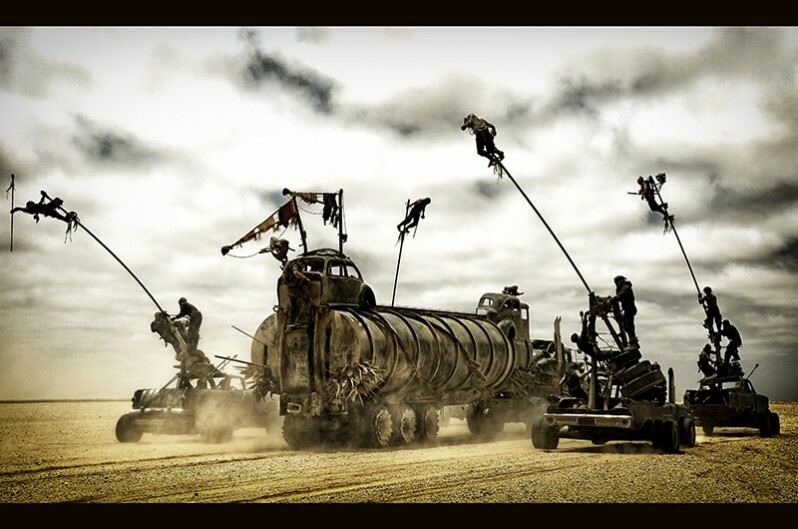 Yes, MAD MAX: FURY ROAD is a wild west ride through the desert, but it has the true essence of the western in that it has spirit. It has art. It doesn’t preach, but it has soul. You feel it. It comes across in the midst of all of this wild action. 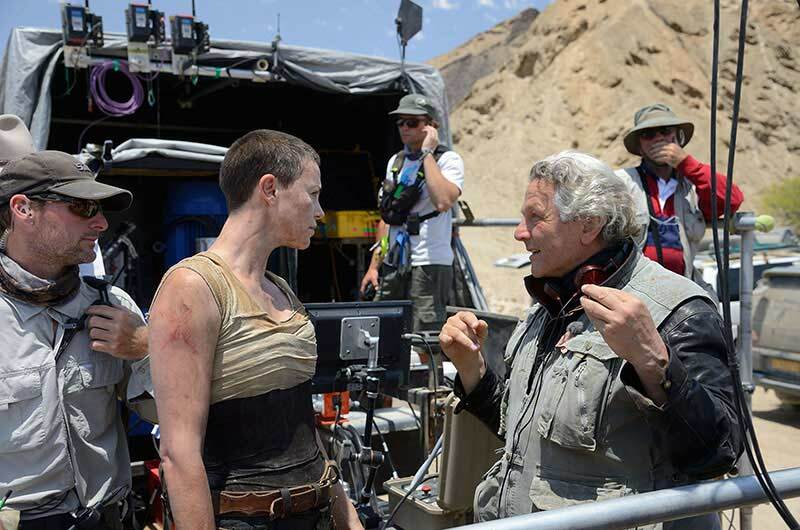 George Miller: I’m glad you feel it. That’s great. I’m so glad you said that, because we worked so hard for that. I like to say, “We have a lot of iceberg under the tip.” And you worry that people will only read the tip. Because you don’t really know about your movie. It’s other people who tell you what your movie is. And now that I read the reactions and have conversations, and people say that about the movie, I realize, “Oh my god, they’re really looking down deep into it. They’re getting a lot out of it.” That’s extremely gratifying.